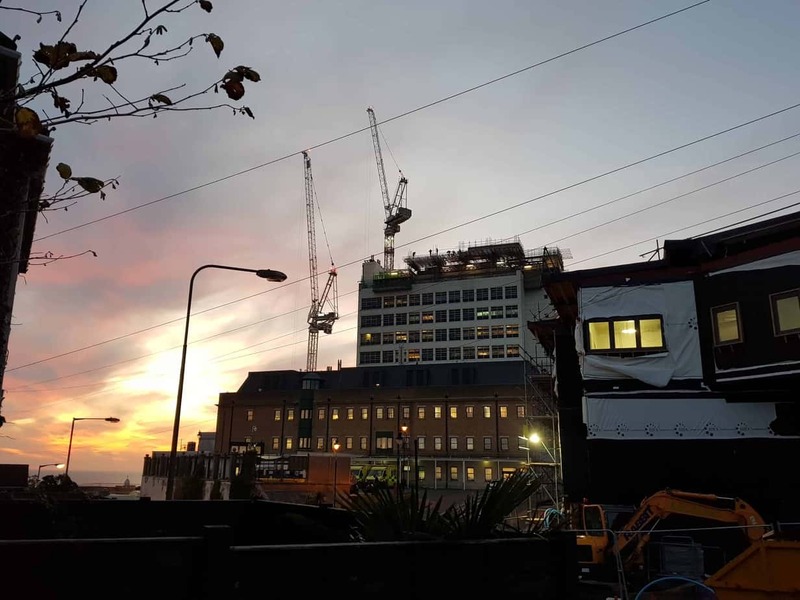 As part of the ongoing refurbishment/construction at the Royal Sussex Hospital in Brighton, THS Concepts were instructed to undertake the setting out works of a new helipad. The helipad is being built on the roof of the existing tower block in the hospital, thus allowing patients to get into the hospital much quicker. Currently, helicopters have to land at a school nearby, from which it takes up to 10 minutes to drive to the hospital. The new helipad will have a lift going directly into the Accident and Emergency ward, saving crucial time. Our project scope was to set out elements for the lightweight aluminium structural frame which will be bolted to an existing steel structure built on the roof. It was quite important that the holes were placed correctly as the helipad structure comes in kit form (Mecano-esque!) with minimal site alterations allowed. Using our Leica TS15 robotic total station we positioned the holes for the new structure to bolt down on. The main problem we faced whilst on the site was access to our survey works. What’s more, the roof was very congested with scaffolding and an existing steel frame so access was very tricky. The access issue didn’t cause any issues other than slowing us down. We had to be quite tactical with where we set up to ensure we positioned each hole. The project went well but we, unfortunately, had to stay an extra day on site due to the obstructions slowing us down. Thankfully the good weather and great view made up for it! Interested in our setting out surveys? We hope you enjoyed reading about this project. If you have any questions or queries about Setting Out surveys, please let us know in the comments section.